Sugar is everywhere. Even in places, you’d never expect it. When I decided to give up sugar, I assumed that meant foregoing dessert and giving up my favorite snack – Peanut Butter Cap’n Crunch cereal, but I soon learned that it was going to take a whole lot more than that. For years, I told myself that sugary treats, especially things like cereal, hard candies, jelly beans and the like, weren’t really all that bad for me because they contained little, if any, fat. When I had my cholesterol checked and my triglycerides were through the roof, I couldn’t understand how that could be – I never added butter to my bread, I didn’t use mayonnaise and I rarely ate fried foods. It was almost like there was a neon sign flashing the word “sugar” over my head, but I continued to ignore it. I told myself that I was a healthy eater so it must be genetics. I’m not the only one to think that, when it comes to obesity and other serious health problems like heart disease, most of us blame fat, when sugar is the actual culprit. Why? Lobbying. In 2016, experts uncovered a massive scandal within the sugar industry that proved the sugar lobby sponsored phony Harvard research 50 years earlier – the lobby paid the researchers to focus on the supposed role of naturally occurring fats in heart disease, to take the spotlight from where it should have been in the first place. And sadly, I realized, I had fallen for it. I was addicted to sugar. I’d add sugar to my morning coffee, and frequently pick up a so-called healthy bran muffin. More sugar. At lunchtime, my coworkers and I frequently enjoyed stir-fry at the restaurant next door. Guess what stir-fry sauce is full of? Sugar. Even when I brought lunch from home, usually a salad, thinking I was really doing great that day, I drizzle on low-fat salad dressing. But when I checked the label, sugar, once again, was a primary ingredient. Of course, I knew how much sugar was in my favorite late-night snack, but I couldn’t resist. And what was all of that sugar doing to my body, and my mind? The effects of sugar on the brain and hormones is a recipe for fat gain disaster. It leads to addiction as it decreases satiety so you want more and more. Those who consume the most sugar, are not surprisingly, the most likely to become overweight or obese. Sugar increases the risk of cancer, one of the leading causes of death around the world. Many experts believe that when your insulin levels are constantly elevated, something that happens with sugar consumption, it can contribute to the development of cancer. Not only that but consuming sugar is linked to metabolic issues, which is a significant driver of inflammation, another cancer risk factor. When fructose is transformed into fat in the liver, it’s sent out as VLDL cholesterol particles, but not all of that fat is shipped out, some of it gets lodged in the liver. That can lead to nonalcoholic fatty liver disease, which is an increasingly growing problem in the Western world and is strongly linked to metabolic diseases. Plus, a healthy, well-functioning liver is essential to overall well-being, as your liver is the organ that’s primarily responsible for cleansing the body of toxins that enter. Sugar wreaks havoc on our mind too. 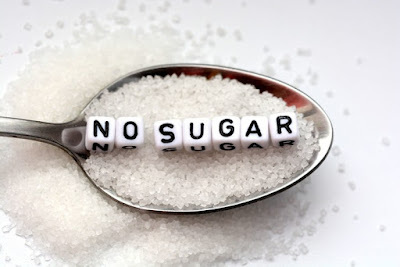 Multiple studies have suggested that there is a strong connection between the amount of sugar consumed and the risk for depression, including sadness, social withdrawal, and lethargy, as well as anxiety. Have you ever noticed that after eating a lot of sugar you feel emotionally drained? That’s because the crash it causes is both physical and emotional. A sugar-filled diet leads to higher levels of inflammation levels throughout the body, which is also associated with greater instances of depression. Analysis of the Women’s Health Initiative published in The American Journal of Clinical Nutrition found that the higher a woman’s blood rose after eating refined grains and sugar, the higher the risk of depression. Of course, that’s not all, but that was more than enough for me. Giving up the white stuff was going to be tough, so before I began, I did a lot of research to dig out the best tips. Most experts advise going cold turkey, eliminating not only added sugar in things like coffee but all of those hidden sugars in things like ketchup and salad dressing, as well as artificial sweeteners, which just make you crave sugar more. Eating more healthy fats helps fill you up more, which helps ease sugar cravings. That includes things like eggs, grass-fed cheese, coconut oil and coconut butter, fatty fish like wild-caught salmon, etc. Not fried fats or trans fats. Instead of toppings like salad dressing or ketchup, use healthier options like lemon juice or balsamic vinegar. By eating simply, meaning whole foods that come from the earth, you automatically eliminate most of the sugar. The easiest way to eliminate hidden sugars, especially when you’re out at a restaurant or when shopping at the grocery store, is to choose food that has as few ingredients as possible. Spices and herbs are wonderful for adding flavor, and lots of health benefits, without the sugar. Here’s what happened when I finally kicked the habit. I thought the first day without sugar was miserable, but day two was even worse. All I could do was think about sugar, and I was absolutely exhausted. I wanted to slap my best friend when I caught her eating a candy bar after she’d promised to give up sugar with me. She couldn’t make it through Day One, let alone Week One. I had been warned by others that for the first five days or so, I’d be cranky, tired and would probably have nasty headaches too. I spent most of the week in misery, and sadly, began to feel that there was no way I’d make it an entire month like this. I was fantasizing about Starbursts and Gummy Worms so often that candy even made its way into my dreams. Sugar addiction is very real. I was experiencing withdrawal symptoms. In 2002 research out of Princeton University, rats who’d undergone a typical sugar dependence protocol underwent “sugar withdrawal” which was facilitated by either food deprivation or treatment with naloxone, a drug used for treating opiate addiction which binds to receptors in the brain’s reward system. Both withdrawal methods led to physical problems, like head shaking, paw tremors and teeth chattering. Similar experiments have led experts to report depressive-like behaviors. For example, rats undergoing withdrawal from sugar are more likely to show more passive behaviors in a forced swim test, such as floating, than active behaviors, like trying to escape, which suggests feelings of helplessness. I could relate. By the end of the first week, I really wasn’t feeling much better and began to question my own insanity. Why was I doing this to myself? But then, on Day Eight, a miracle seemed to happen. Yes, it took eight days. Not five, like so many, had said. By then, I still wanted sweets, but I no longer felt like some crazy person. I managed to make it through the afternoon crisis, a time when, in the past, I’d always grabbed some kind of sugar-filled snack to get me through an energy slump, I instead sipped a cup of green tea. The difficulty came when our office celebrated a birthday, with a cake. The kind of cake that has that delectably sweet, sugary frosting. I could easily scrape all of the frosting off and eat it. Resisting a piece of that cake was not easy, let me tell you. I could almost see that little angel and devil on my shoulders duking it out, but in the end, I realized that if I messed up now, starting over after all this time was going to be a lot worse than after just a couple of days. Somewhere between Week Two and Week Three, I noticed a dramatic change in my mood. I felt happy! I wasn’t thinking about sugar all the time, and I was able to really focus – it was like the brain fog finally lifted. I was yet another statistic proving what experts have already found, sugar consumption can make you depressed because it can cause chronic inflammation which negatively impacts brain functioning. The mood-lifting and general improvement of brain functioning were both highly motivating – if that cake showed up now, the last thing I’d want to do is have a slice. A slice of sadness, I now say. After four weeks without sugar, my pants were noticeably looser and my face looked thinner too. I got on the scale and I was almost six pounds lighter! That’s a significant amount for a woman who is practically midget-sized. When I looked in the mirror, I also realized I hadn’t had a breakout in several weeks. In fact, you could almost say my complexion was glowing. Something I hadn’t expected, but did some quick research and found out why. The author of The Age Fix: A Leading Plastic Surgeon Reveals How To Really Look Ten Years Younger, Dr. Anthony Youn, explains, “Sugar causes glycation, a process by which the sugar molecules bind to and deform the collagen and elastin in our skin. Collagen and elastin are the two main proteins that give our skin its youthful, supple properties, so we want to preserve them as much as possible. Giving up (or reducing) the amount of sugar you eat can also reduce glucose and insulin spikes in your bloodstream, reducing chronic and acute inflammation linked to aging.” Youn also added that you’re likely to notice a “glow” within 14 days of eliminating sugar. I was sleeping better too, and that’s likely because I no longer had a habit of enjoying a sweet midnight snack. Apparently, eating sugar just before bedtime increases stress hormones which lead to sleeping problems. I hadn’t known that before making the decision to give up sugar, but it’s certainly reason enough alone. I realized that I’d been sleeping better almost since the start, at least by Week Two if not sooner. Something else, that may or may not be related to kicking the sugar habit is that I didn’t catch the office cold that was going around. In the past, if someone came to work sick, I inevitably came down with it too. As sugar can weaken the immune system, that may very well have been the culprit. A study published in the American Journal of Clinical Nutrition discovered that eating just a half-cup of sugar lowered white blood cells’ ability to kill bacteria by as much as 50 percent, and the effect lasted for up to 5 hours. Considering that the average person consumes some 170 pounds of sugar a year, or 340 cups, it’s easy to see how much damage it’s actually doing. All in all, after four weeks of no sugar, I’d lost weight, felt happier and more focus, had more energy, slept better and my skin looked amazing. Will I go ever go back to where I was? No. Although I may allow myself to have the occasional treat, I have gained a much better understanding of moderation and the importance of my good health.